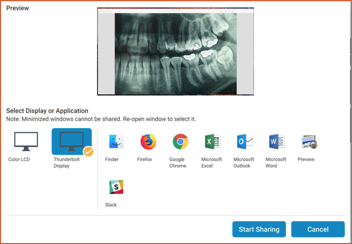 The screen share option allows you to share your desktop. Click the Start Sharing icon (the computer screen). A Preview window will appear that will show you what you are about to share. If you have multiple monitors, you can choose which display to share if you want to share that entire desktop. Or, you can choose a single application to share. Once you have chosen what to share, click Start Sharing. While you are sharing, a small control window appears that lets you pause, stop, choose a different screen or application to share, or hide the preview. Pausing sharing can be handy when you are sharing your desktop and need to check email or something else that you don’t want others to see while you are sharing. You can then resume sharing at any time. Stopping a share still leaves the chat session tab open so you can continue your communication.